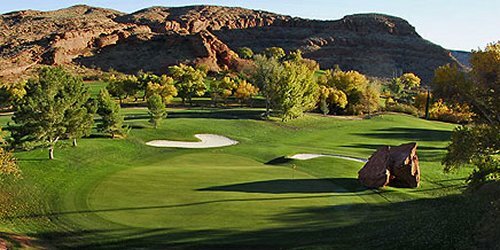 Dixie Red Hills Golf Club opened in the mid-1960s and, because of its spectacular red rock setting and playability, it has been the favorite of recreational golfers ever since. This golfer-friendly course also features hundreds of mature Cottonwoods, Mondale Pines, Mesquite, and other trees that provide ample shade during St. George's warmer months. Each hole is distinct and will leave a lasting memory in the minds of golfers. Golfers often talk about being addicted to the game, once you play Dixie Red Hills, you to will understand the game's allure! Dixie Red Hills Golf Course reserves the right to change price and offer at anytime. Prices and offer are subject to change without notice. UtahGolf.com is not responsible for errors posted in this golf package.